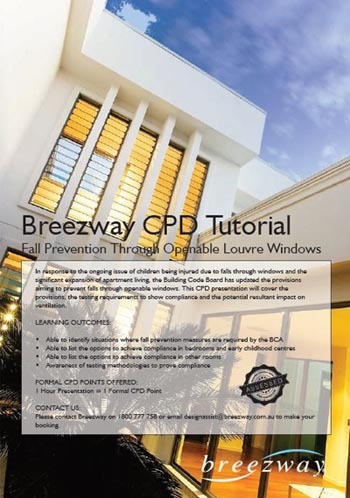 Breezway offers three Formal CPD Tutorials accredited by Architectural Informational Services (AIS) to assist with your building designs. CPD Tutorials can also be delivered online for specifiers in remote locations. In response to the ongoing issue of children being injured due to falls through windows and the significant expansion of apartment living, the Building Code Board has updated the provisions aiming to prevent falls through openable windows. This CPD presentation will cover the provisions, the testing requirements to show compliance and the potential resultant impact on ventilation. Able to identify situations where fall prevention measures are required by the BCA. Able to list the options to achieve compliance in bedrooms and early childhood centres. Able to list the options to achieve compliance in other rooms. Awareness of testing methodologies to prove compliance. This tutorial will explain the scientific benefits of ventilation and will then take you through a thorough presentation of the impact on ventilation of different window types. A modelled energy efficiency study will then be discussed followed by a briefing on the WERS ratings for screened windows. 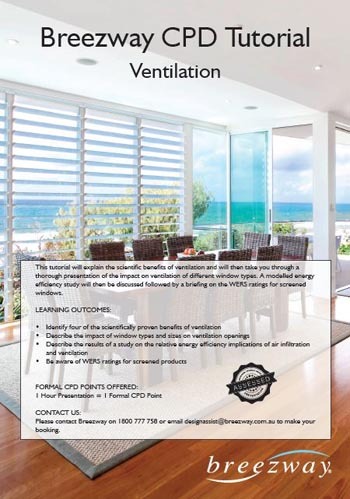 Identify four of the scientifically proven benefits of ventilation. 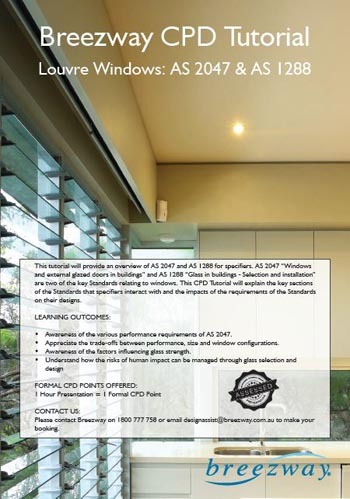 Describe the impact of window types and sizes on ventilation openings. Describe the results of a study on the relative energy efficiency implications of air infiltration and ventilation. Be aware of WERS ratings for screened products. Call Breezway today on 1800 777 758 or email designassist@breezway.com.au to make your booking. “Please thank Warren on our behalf for a very informative CPD presentation on Fall Prevention and Ventilation. We have had presentations by Breezway in the past and each time it has been really worthwhile in getting us up to speed on the issues presented.